The Shiba Inu — Right Dog Breed for You? What is a Shiba Inu Dog? The Shiba is the smallest of the native Japanese breeds. They are not a small Akita, but a separate breed developed to be a hunting dog in Japans mountain regions. Females stand 13.5 to 15.5 inches at the shoulder and weigh around 17 pounds, while males are 14.5 to 16.5 inches tall and weigh an average of 23 pounds. What endears people to Shibas is their mixture of spitz, terrier, and cat-like characteristics. They are sometimes mistaken for a fox by those unfamiliar with the breed. Shibas are easy to care for; dirt seems to flake off their thick coats. They have a moderate activity level and are tough enough to survive outside but small enough to make good house pets. Shibas are good family dogs, especially with responsible children who can be careful not to let them escape. The grown dog is loyal and fun loving. The Shiba is a long lived dog, (average lifespan is 13 -15 years) and with the right training can be a pleasure to own. Shibas can be independent and challenging to train, but they are also smart and often excell in Agility, Obedience and Rally, Flyball, Treiball, or even lure coursing and herding, or work as a Therapy dog. The Shiba is long lived, (average lifespan 13 -15 years) and with the right training can be a pleasure to own. A relatively healthy breed, the only prevalent concerns seems to be to check for patellar luxation and hip dysplasia. Choose a puppy from parent that have been certified clear of these diseases and you should have a healthy, active companion. Shibas have a sunny disposition, are patient with children, yet tough and strong enough to keep up with the most active family. Most of them get along quite well with cats, says author Gretchen Haskett, but they should not be trusted with ferrets, gerbils or hamsters! After all, they were bred for hunting. Only a few Americans use their Shibas for hunting, but they still have the ability. They love an outing in the woods and are outstanding trackers. Shibas have been known to pounce catlike on rodents or leap several feet in the air to catch a bird. 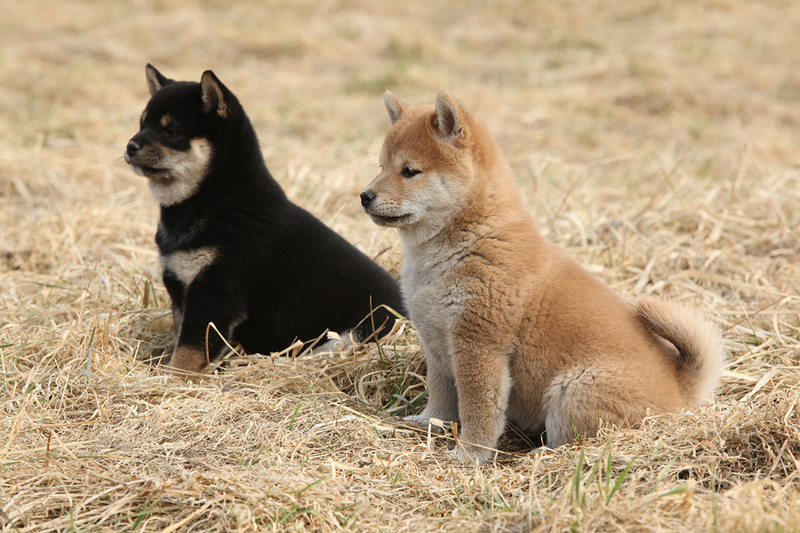 Shiba puppies often play the same “hide and pounce” game as kittens do to develop their hunting skills. Some Shibas are dominant, some are shy, and many are independent and territorial. They may fight for dominance in a multi-dog household. Because of their escape artist tendencies (digging and jumping), they generally require more secure fencing than most dogs, and it can be difficult to train a Shiba to be reliable off lead. They need excellent socialization as young puppies, and they also need to recognize at a young age that their human is their pack leader. The Shibas protective instinct makes her a useful watchdog, and her playful spirit and sense of fun will delight every member of the family. The name Shiba means “brushwood,” perhaps so named because they hunted in brushwood, or because their coat is the redish-brown of brushwoods in the fall. Their ancestors, thought to originate in China, date back to 7000 B.C. Originally there were three strains of Shibas, named according to the area from which they came: the Shinshu, the Mino, and the Sanin. In 1928, Dr. Hiroyoshi Saito founded a club to preserve the native dogs. The club was named Nihon Ken Hozonkai, which means Association for the Preservation of the Japanese Dog (Nippo for short). Nippo held its first annual show on November 6, 1932. It was held every year until 1942 when World War II put a halt to all dog-related activities. After World War II, the native dogs of Japan were almost extinguished. The few that were left were ravaged by an outbreak of distemper. 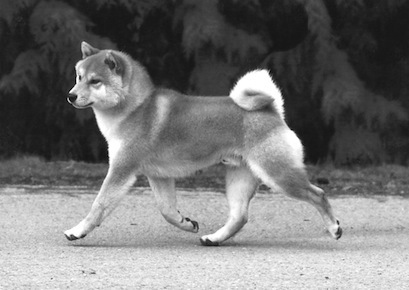 Eventually breeders from the countryside brought the survivors of the various lines into the cities and they were combined to produce the bloodlines from which modern Shibas decended. Postwar Shibas were very inbred and a variety of health problems surfaced. On the positive side, using relatively pure stock and a small gene pool made re-establishing the breed close to the original Japanese native dog much easier. It is unclear when the first Shiba came to the United States, ubt the first imported Shiba with U.S. registered descendants was Nidai Akajishi of Sagami Ikeda Kensha in April of 1973. Initially in America there were differing opinions and some confusion with the breed clubs. The Shiba Club of America (SCA) was formed on the west coast in July 1980, and they held their first show in October of that year. The National Shiba Club of America (NSCA) was formed on the east coast in 1983, and held its first specialty show in 1984. The NSCA adopted an American version of the standard that allowed a wider size range and all colors and markings. A third club, the Beikoku Shibainu Aikokai (BSA) was formed in California in the mid 1980s, holding their first Nippo-style show in January of 1986. A fourth club, the Shiba Ken Club, was formed in 1987 with its main goal to educate breeders about the Japanese roots of the breed and to encourage the AKC to accept transfer registrations from either JKC or Nippo so that breeders could continue to import Shibas after AKC recognition. The first SKC show was held in 1987. In 1991 the SKC voted to merge into the SCA, which still uses the Nippo Standard. In 1991 the AKC voted to accept the Shiba into the Miscellaneous Class and named the NSCA as the parent club. This Shiba shows nice side gait and extension. standard became more popular among breeders. The NSCA eventually adopted a version of the Nippo Standard and the AKC adopted it as the official breed standard in 1997. Shibas have a double coat, the outer coat being stiff and straight and the undercoat thick and soft. Three colors are accepted: Red; Black with tan points; and Sesame, which is a red sable with black-tipping evenly on the body and head. Clearly delineated cream or white markings are required on the sides of the muzzle, on the cheeks, inside the ears, on the underjaw and upper throat, inside the legs, under the tail, and on the abdomen. Hip dysplasia also occurs with surprising frequency in the Shiba, considering the small size of the dog. A variety of other health problems have been reported in the breed, but not on a widespread basis. These include eye problems, heart murmurs, kidney failure, liver disease, double-jointed (popping) hocks, leg perthes disease, thyroid disease and other autoimmune disorders. Allergies are also a problem in the breed, including inhalant allergies, known as atopy, that typically cause itching. The NSCA recommends that all breeding stock be certified clear of hip dysplasia by the OFA, checked for patellar luxation and registered with OFA, and have had their eyes checked for hereditary defects and registered with either OFA or CERF. You can get to know the breed a lot better by reading my favorite book about the Shiba Inu. It is called The Total Shiba and was written by two long-time fanciers and breeders, Gretchen Hatchett and Susan Houser. 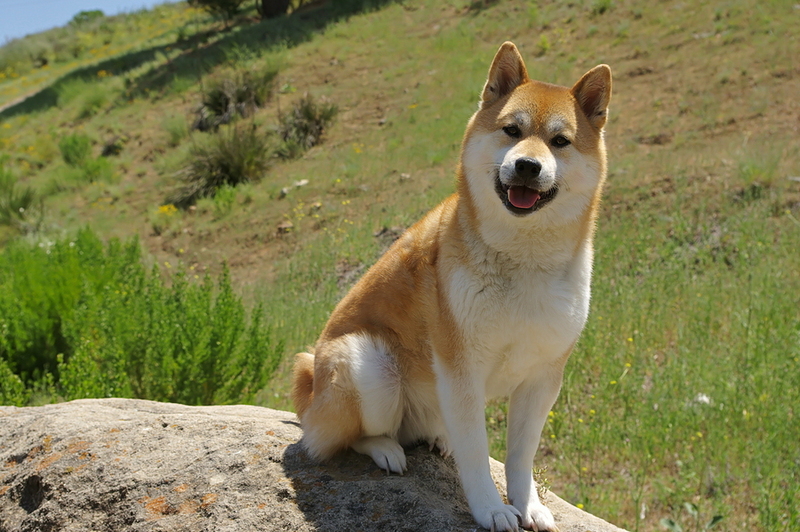 It is particularly helpful for those wanting to study the genetics and pedigrees of the breed, especially important imports, and to those wanting to learn the Shiba Breed Standard. The illustrations are priceless. More information is also available on the club websites. This entry was posted in Breeds of Dogs, Shiba Inu and tagged Characteristics of Shiba Inu, choosing a dog breed, Choosing a Shiba Inu, dog breeds, eye problems in Shibas, health problems in Shiba Inu, hip dysplasia in Shiba, History of Shiba Inu in Japan, Japanese dog breed, Nippo standard for Shiba Inu, patellar luxation in Shibas, Shiba breed standard, Shiba dog clubs, Shiba Inu coat colors, Shiba size and weight. Bookmark the permalink.